DebitWay.ca, the Montreal, Quebec, Canada based alternative payment service provider (PSP), is once again helping social gaming enterprises reward customer loyalty. This time it is Wargaming.net, the creator of the massively popular World of Tanks (WoT) and World of Warplanes(WoWP) franchises who is benefiting from the Canadian PSP’s years of expertise. Last summer, DebitWay.ca’s Business and Technology department unveiled its newly designed Loyalty Program. 186card.com was the first to implement a reward system to users who opted to transact on their site via DebitWay.ca’s platform. Since then, DebitWay.ca has continued to both grow and help its social gaming partners by providing hands on promotional assistance. “Our loyalty program is just one way we try and help our merchant partners. We want them to succeed and we do everything we can to promote that success. If we can help with banner creations, social media interactions, or in depth articles... we do,” Affirmed Director of Business Development and Production, Rod Tomita. Social Gaming giant Wargaming.net, whose headquarters are in Nicosia, Cyprus, will be launching a 1 week (Sept 25th – Oct 1st) Gold as a Bonus event. 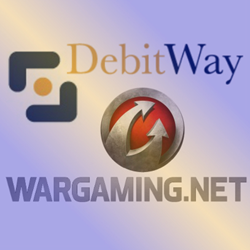 Registered Canadian users of the popular Massive Multiplayer Online (MMO) titles World of Tanks (WoT) and World of Warplanes (WoWP) who conclude their transactions via DebitWay.ca’s payment platform will be eligible for a Gold Bonus. While originally founded in 1998, Wargaming.net became a household name in the MMO gaming world with the advent of their smash, free-to-play, real time simulation (RTS) game, World of Tanks (WoT) in 2009. “The year 2010 marked the true turning point for Wargaming. The company had transformed itself from a developer of military real-time strategies into one centered around massively multiplayer online games.” States Nina Chumenko. In 2011, building off of the incredible WoT success, the social gaming giant unveiled and launched its second (RTS) title; World of Warplanes (WoWP). DebitWay.ca has been a leading alternative payment service provider for more than a decade and as such has partnered with online merchants in industries like; Social Gaming, Digital Currency, Remittance and Telecom to name but a few of the enterprises deemed “High Risk” by the financial industry, that DebitWay.ca has provided alternative payment solutions to. In so doing, DebitWay.ca affirmed its mandate to stand by merchant partners and offer hands on assistance. Wargaming.net’s latest “Thank You” event will offer Canadian gamers a 30$ and a 62$ (USD) Gold as a Bonus bundle package. While other electronic merchants may opt to set up their Loyalty Programs to implement rebates on purchases or coupons for use at a later date, the fact remains that DebitWay.ca’s Loyalty Program can be used any number of ways. As the eCommerce world continues to grow so to have payment service providers (PSP) like DebitWay.ca. Replacing the once stiff and stringent world of transactions processing with a more flexible and comprehensive approach. Creating a worthwhile symbiotic relationship between the merchant and PSP. Headquartered in Montreal, Canada, since 2004, DebitWay continues to be one of the leading Payment Service Providers in the world, as well as a Certified Payment Provider of INTERAC® Online Payment (IOP) solution in Canada. DebitWay merchant partners continue to benefit of being able to accept bank payments in real-time instantly.